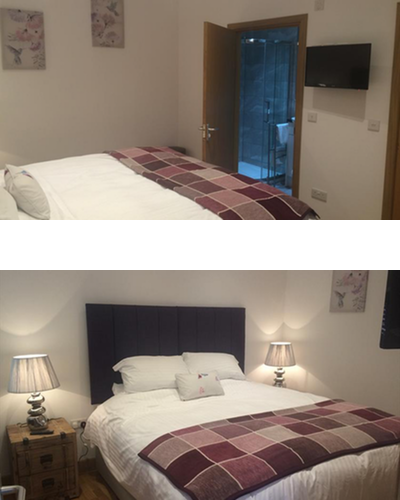 The new accommodation was completed in January 2016 to a high standard. The rooms are set within the court yard of The Radnor Arms and are accessed via a private porch area using an electronic fob system. Each room is unique and furnished with a king-size bed that can be split into singles. Tea and coffee making facilities are available, free WiFi and Smart TVs. The en-suite bathroom has a full mirrored wall, shower, sink/vanity unit, WC and heated towel rail. The Holiday Let is a self contained unit, again to a very standard with a private enclosed area to the front. Access to the Cottage is through the Radnor Arms court yard. The Cottage entrance is via an oak stable door which leads directly into the living area. The lounge has a vaulted beamed ceiling and is furnished with a corner sofa (equipped with an integral double sofa bed if required), smart TV free, WIFI and a flame effect electric wall fire. The kitchen is equipped with a washer/dryer, fridge, dishwasher, hob and oven. The bathroom is located on the ground floor and has a sink/vanity unit, large walk in Shower, WC and heated towel rail. An oak stairway leads to a gallery-beamed open plan bedroom with a quirky custom made double bed. For bookings and availability please view the Radnor Arms on booking.com. Alternatively for further information with regards to available special-offers; weekly & weekend short-stay discounts, or to negotiate long-stay preferential rates, please contact Paula direct on 07912 868111 or email enquiries@linnaeainns.co.uk. Additional information is available at Visit Wiltshire.